This is always a fun venue. Ryan Coelho and his crew work hard to put this all together! We are grateful for that and thankful that they encourage our teammates to come! 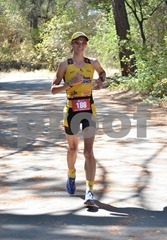 I’m coming off a week of training in Tahoe. Thanks to Nana Sue and Papa Ray, the girls got to enjoy time at their house while Mommy got to train. My friend Dave Campbell and I rode most of the Ironman Tahoe bike course on Wednesday. We were both beat so we’ll see how we both feel today. I get a 4 minute head start since I’m in the first wave (men & women, 39 and under). Will I be able to hold him off? Troy leads the FCA Endurance Pre-Race Prayer. He does a great job and reminds me to look for the opportunities to help others and glorify Jesus. We pray as a group and get our minds really set in the right place. The prayer that sticks out to me was gratitude for having the ability to do this. Time to get in the water and get ready to go! The water is surprisingly chilly but this is good practice for Ironman! I get in a quick warm-up and then it’s to the deep water start. We’ll be swimming into the sun for at least a third of the distance. I just hope I can find a good draft to get through that first part. That will also help with a better time, too. It’s a nice change to be starting with guys, too. That should speed things up! My goggles are fogging up and I’ve accidentally made some smears on the front with my sportslick anti-chaffing gel. I put a tiny bit of water on each side to create a windshield wiper effect. Ready, set, go! It’s super hard to see anything ahead but I am surrounded by other swimmers so I must be fine. After a few minutes, I settle behind a few swimmers. It goes well for a time and then they slow down. I surge ahead to catch up to some others. By the time I reach the first turn buoy, I’m really close. I focus using my arms to propel me by pulling the water with more power. I catch the swimmers at the next buoy…yeah! I latch on and get a nice ride towards the final buoy. This group slows, too, so I make another surge to catch 2 more swimmers. I round the final buoy and push hard. I catch up to the 2 swimmers. One of them heads off to the right and I let her go. I stick with the other and let her pull me home. I come out of the water and pull off the side to get my wetsuit off. It actually comes right off once I push it down and kick it off. Thanks Lord! I glance at my watch and it looks like I did a 32 minute swim. Yeah! I get to my bike and put on my light jacket. I probably won’t need it but I want to be comfortable today. I make a decent transition despite the extra work involved. I wave to Troy and then to Sandy, Dave’s daughter, on the way out. As I get out on Folsom Blvd, I realize that Troy and I never discussed a goal for the bike. 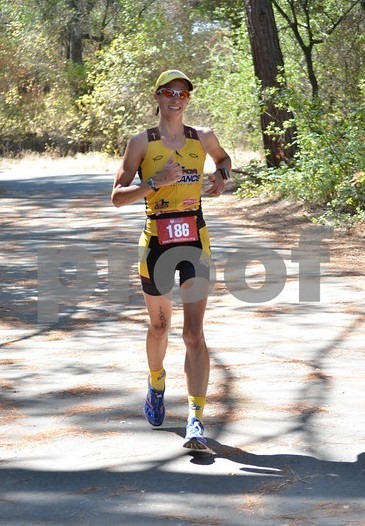 I decide to try to do my plan that didn’t work out on the first loop of the Full Vineman: average 19.2 (sub 3 hours). 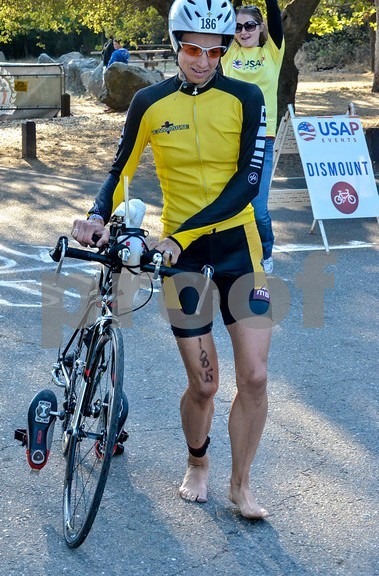 I didn’t taper much for this race. It will be interesting to see what happens! Mile 5. I’ve passed 3 girls and there are no others in sight. I wonder if the course is like last year. I didn’t even look at the map and so I have no idea where we are going. This is definitely poor preparation on my part! Mile 10. Once I get to El Dorado Hills, we turn right and take a long winding road. Oh, yeah, this is going to be a one loop course…. great! Even though the roads so far are rolling hills that wear me out, it’s a nice change. More guys are passing me now and I’m anticipating some women are coming…and Dave, too! I’m almost averaging 19mph. Yeah! Thanks Jesus! Mile 15. I see an aid station and it’s staffed by one girl. I come in close to grab water but don’t fully commit. The bottle drops…ugh! It’s okay, I’ll live. A few minutes later the sag wagon pulls up next to me. The guy is holding out a water bottle…wow! I look ahead but lean in close and stretch my hand out. I feel the bottle and grab on tight! “Thank you!” I actually got it, phew! Lord, you are watching over me! A girl in a pink Hammer Nutrition jersey passes me. She is strong! After pulling back and surging, I pass her back. It’s short lived and she takes off and pulls away. Mile 20. My average is still hovering near 19mph. I am enjoying this change of scenery despite the continued rollers. A few more guys have passed. One that passes catches my eye because he’s really moving! I put my head down and look up again. Whoa, he’s a challenged athlete that has a prosthetic left leg. I am in awe! Thanks for the inspiration. Just awesome! Mile 25. We eventually turn on Jackson Road. This is much flatter…yeah! My average starts to improve. Mile 35. I’m pretty much at 19.2 mph. Thanks Lord! This is awesome! 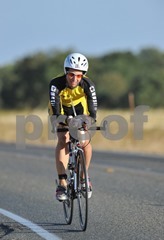 I am still getting passed by guys and I am tempted to get bummed out because I just cannot push the flats as well. I feel the Lord reminding me to be content and focus on the goal being met! I get some water successfully at the next aid station. There were 3 people at this one but fortunately I didn’t need back-up help. I got the first bottle I reached for! Mile 40. The flats are great but I am looking forward to a change of scenery again since I’ve been on this road for over 12 miles. I see a guy walking his bike ahead. I get poised to slow down. I lost my tool bag at Vineman and have my gear in my Bento box up front this time. The easy access is nice! Before I get the chance to stop, another guy pulls over and helps. Wow, that’s awesome! It’s so good to see others helping out here! Mile 45. We turn on the Folsom Canal Trail. Ah, this is the time trial road I’ve ridden the last few years at the Folsom Cyclebration Festival. There is added pressure to make this really count. I see a guy up ahead pulled over on the side of the road. I pull over and ask him if he needs something. He has a slow leak and could use a patch kit and an extra CO2 cartridge. I hand him both and check to make sure he can take it from here. He’s good so I head out with a “God Bless”. During my stop, I noticed the other guy that stopped to help someone passed me. Mile 50. A few more miles down the road, there is another rider with a flat. Before I could stop that other guy is back in action and stops again. I pass by and tell him “great job helping!”. I wish I could see his race number so that I can have Nick Tuttle talk him up. As we continue down this canal road, I’m amazed how far it goes! I had no idea it kept going even after crossing a few roads. It’s all well marked and the hazards such as old railroad tracks are covered with carpet. Very nice! My average is over 19.2! Yes! I’m going to go under 3 hours! The guy I helped goes by and tells me that he figured out the problem and didn’t need my stuff. That’s great news to hear. I tell him to go for it and he flies off. Mile 55. We turn off the canal right before Lake Natomas. Wow, this was a great stretch of road that kept us away from cars and very safe. I am excited to get off this bike. I am tired and my bottom is sore but I don’t have any hamstring or hip-flexor issues this time. Thank you Lord! I’m almost 4 minutes under 3 hours! I run into transition and hear people like Flor Hodges and Troy cheering for me. It’s all a blur as I take off my jacket and get my running shoes on. It seems like a good transition and then I’m off again. As I exit, I see a u-turn arrow for the long course. Oh yeah, it’s a double out-n-back. Although it’s not good not knowing the course, at least it has kept my mind wondering what the next surprise will be. So far there is no Dave but I know his specialty is the run and I cannot think of a time I’ve ever beat him in any run. We’ll see what happens. As I run towards mile 1, my Espresso Hammer Gel falls out of my pocket. I hesitate but go back for it. I might need that caffeine soon so I don’t want to waste it! It’s hard to get going again physically and mentally. Once I see some runners in the near distance, I perk up. I wonder how many girls are ahead of me. Mile 1 is 7:41. Good start! I soon get into a better rhythm and actually feel smooth. I see an FCA teammate Rosie cheering. I give her a high five as I go by. Mile 2 is 7:21. Better. I see the pink Hammer gal and catch her. We encourage one another as I go by. I see two girls coming back already. One is wearing running shorts…relay? Hum, wonder if they are the leaders. I see FCA and Tuesday night track teammate, Janell. We high five each other. Soon, I see three more gals flying: one is has a Facebook jersey and another has a Team Sheeper jersey. Maybe they are 3rd to 5th. I could be in 6th right now! I take my Hammer Gel and hope for a boost. Mile 3 is 7:24. The turn around is ahead and now I’ll get a good look at where Dave is at. There he is! He’s probably a mile behind at the moment but he looks strong. We smile and I jokingly say “I’m doomed”. The excitement of trying to hold him off does make me get going. Mile 4 is 7:29. Getting hard now! This bike trail is rolling and it definitely breaks up the rhythm! I miss water at the next aid station because the volunteer just gave out his water cup to someone else. No bother, I’ll be good. Mile 5 is 7:22. Better! I pass Janell going back and encourage her. Mile 6 is 7:11 at the u-turn. Alright! Thank you Lord! Soon I see Dave smiling. He looks great and has definitely closed the gap. I pull my Clif Blocks out of my pocket and get ready to have some. Sure enough, I drop it at just about the same spot as my gel. Again, I go back. I struggle to get moving again and I even hear myself say “just slow down, you won’t beat Dave anyway”. It’s a trick of the mind! I get going again. Mile 7 is 7:17. I pass one of those gals. 5th place? I’m still in the hunt! I can maybe catch those other 2 girls! I look at my watch and start to calculate my finish time. I could go under 1:38 for the 1/2 marathon! I could go under 5:10 for the whole race! Mile 8 is 7:32. Boy these rollers are tough! I see those 2 gals coming back. Wow, no way I can catch them! There is still a chance they could be relay! Mile 9 is 7:22. I see the Facebook girl and she looks great! She’s smiling and seems to be floating along! The Team Sheeper girl comes along a bit later and is starting to look tired. Maybe I can get her? Mile 10 is 7:34. I make it to the turn around and look for Dave. He’s closer this time but he’s not smiling as much. Oh man, maybe I can hold him off. Mile 11 is 7:22. As I look at my watch I can see that my time goals are going to be close but probably just out of reach. Gotta always keep trying though…”you never know” as Troy and I like to say. Mile 12 is 7:35. I have yet to see the Team Sheeper gal. Don’t get discouraged, keep trying! My time goals are starting to tick away. I thank Jesus for what I have been able to accomplish today! Mile 13 is 7:22. I turn a corner and see the Team Sheeper gal! She’s too far ahead to catch but I’m not going to let up anyway. This way I’ll get to finish with Anna with no problem. I finally make it to the last turn and see Anna getting her shoes on. She gets them on right in time and jumps up to grab my hand. We finish together with big smiles. I bend down to hug her and praise Jesus.